MULTAN: The Pakistan Tehreek-e-Insaaf has grabbed all National assembly seats for which counting has been completed in Multan. The party has also bagged six NA seats till the filing of this report and 13 provincial assembly seats. In NA-154, Ahmad Hussain Dehair won 74,220 votes and defeated Abdul Qadir Gillani of Pakistan Peoples Party (PPP), independent candidate Sikandar Hayyat Bosan and Suleman Qureshi of the Pakistan Muslim League-Nawaz (PML-N). A total 214,634 votes were cast out of which 5,103 were rejected in the constituency. The voter turnout remained 57.04%. Amir Dogar bagged 135,726 votes in NA-155 and defeated Tariq Rasheed of PML-N. Around 236,624 people cast their votes in the constituency while the voter was 49.27%. PTI Vice President Shah Mahmood Qureshi secured 116,272 votes and defeated Amir Saeed Ansari of PML-N in NA-156. A total of 221,777 people cast their votes out of which 3,039 votes were rejected. The voter turnout was 49.87%. Zain Qureshi, son of Shah Mahmood Qureshi, won from NA-157 and secured 77,371 votes. He defeated Ali Moosa Gillani of PPP and Abdul Ghaffar Dogar of PML-N. Approximately, 223,755 people cast their votes in this constituency while the voter turnout remained 57.27%. Ibrahim Khan received 83,304 votes in NA-158 and defeated former prime minister Yousaf Raza Gilani. At least 247,675 people cast their votes out of which 5,690 votes were rejected. The voter turnout of the constituency remained 56.76%. Rana Qasim Noon won from NA-159 by receiving 126,06 votes. A total 233,413 votes were cast in this constituency and the voter turnout remained 56.48%. For this provincial assembly seat, Shah Mahmood Qureshi was defeated by independent candidate Mohammad Salam Naeem in PP-217. Therefore, he lost the chance of becoming the chief minister of Punjab. Naeem secured 35,294 votes while Shah Mahmood Qureshi received 31,716 votes. Local leaders of Pakistan Tehreek-e-Insaf (PTI) continued celebrations on Friday and distributed sweets at Mauza Rangeelpur. Haji Arshad Mahmood and Chaudhry Shafiq Arain congratulated PTI Chief Imran Khan on his recent post-election speech and hoped all resources would be utilised for the welfare of the people. They also congratulated all PTI candidates who won the elections, including PTI Senior Vice Chairman Makhdoom Shah Mehmood Qureshi and his son Zain Qureshi. 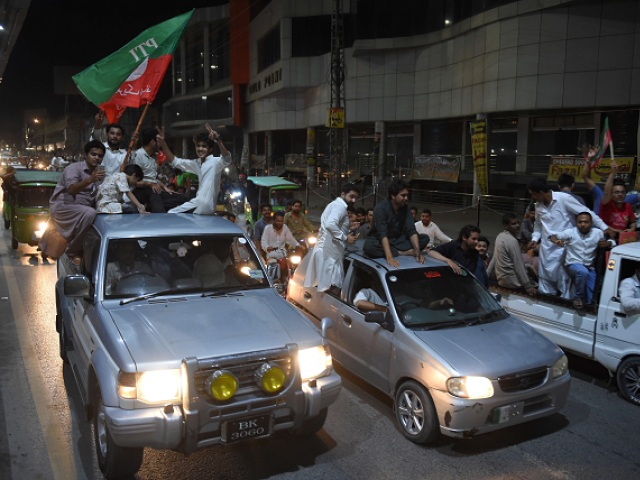 Similarly, the women’s Wing of PTI celebrated the party’s victory and distributed sweets on Khanewal Road. The women workers chanted slogans such as as ‘ Prime Minister Imran Khan’ and said the PTI had won general election across the country with a great mandate. They hoped the leadership of Imran Khan would come up to the expectations of the masses. The PML-N candidates for National Assembly and Punjab Assembly seats demanded a recount of votes in their constituencies. Addressing a press conference at Press Club Friday, PML-N candidates for NA-155 Sheikh Tariq Rasheed, NA-156 Amir Saeed Ansari, and PP-216Haji Ehsanuddin Qureshi alleged rigging in the general elections. They claimed polling results were given to polling agents on white paper and not on Form 45. The PML-N candidates said that they would use all channels to get justice and demanded the party leadership devise a plan in this regard. As the PTI has won a maximum number in both the national and provincial assemblies Multan, Layyah, Rajan Pur and Dera Ghazi Khan, voters are asking candidates to fulfill their promises of establishing a Seraiki province. Civil Society Activist Maroof Naeemullah said candidates had promised a separate province for the people of southern Punjab. They added that now the party should not disappoint the people. He PTI emerged as the single largest party and this occurred only due to the vigorous support of people. A young voter, Ali Murtaza, told The Express Tribune that the injustices committed against people of southern Punjab could only end if budgets were allocated for them rather than all the money being spend on Lahore. “We have followed the advice of Imran Khan and voted for him. We cast aside the shackles of biradri, clan, tribe or sect,” said young voter Aleena Zafar. She added PTI owes its victory to the people of Pakistan and now it is time to fulfill these promises. Published in The Express Tribune, July 28th, 2018.